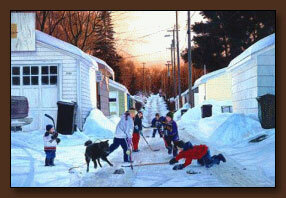 Purchase Terrence Fogarty's Sports Art Prints from ArtBarbarians.com located in Minnesota. Although wildlife art is our specialty, there's another genre which we take a lot of pride in carrying, the sports artist. One of the best artists in the category is available from our large inventory, it's Terrence Fogarty. Like most people you probably can identify with a simpler time when nothing was better than going outside with your friends. And this artist brings out those feelings or youthful days that we treasure so much and we feature here on our web site or you can check out a video interview with the artist exclusively from Art Barbarians (32MB). We have a couple of examples of this fine artist's work. You get a sense of perspective in his art and an excellent color representation that is deep and rich. 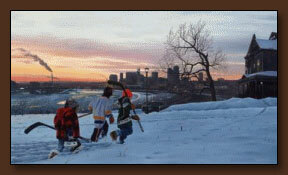 Terrence Fogarty art prints are famous to Minnesota sports enthusiasts. He has been commissioned to paint some of the most historic sporting events in Minnesota. "A common question I get is what experiences have inspired me to paint sports scenes since I was in grade school? If I had to name one event that may have contributed to my interest in sports as a subject matter, I might have chosen a Saturday when I was 10 or 11 years old. I was walking down University Avenue toward Memorial Stadium with my father. It was a brilliant fall day. In the background the band played and I was as close to heaven as a 10 year old can get anticipating a box of corn and an afternoon of football. The beauty of that day was the simple elements of a sporting event, the band, stadium and the crowd. I sometimes create images that remind me of the way sports were, images that sometimes are a little too perfect. Maybe it's a subconscious influence of Norman Rockwell's images. I really can't say. Conversely, some of my paintings are simple, stark reality. These images, like a piece I did on a baseball field in Montana are without embellishment. They are scenes true to life, but in many cases even more romantic than the pieces where I have chosen to use artistic license. The beauty of painting this subject matter is that there are always images on the sports landscape that need no embellishment. If they do happen to require an extra blade of grass or an additional bit of color in the sky, I am more than willing to recreate the perfect version of sports I had when I was 10." Another one of the great Terrence Fogarty art prints is the picture below which is titled "Coming Home". This image gives the feeling of being tired, but feeling good after a long day out on the ice. It looks so much like the Midwest and you can almost smell the fresh, cold air just as the subjects of this great print did. Call us if you have any questions about anything you see on our web site or need to know more about Terrence Fogarty art prints. We're happy to answer your questions personally regarding availability or something special you're looking for.